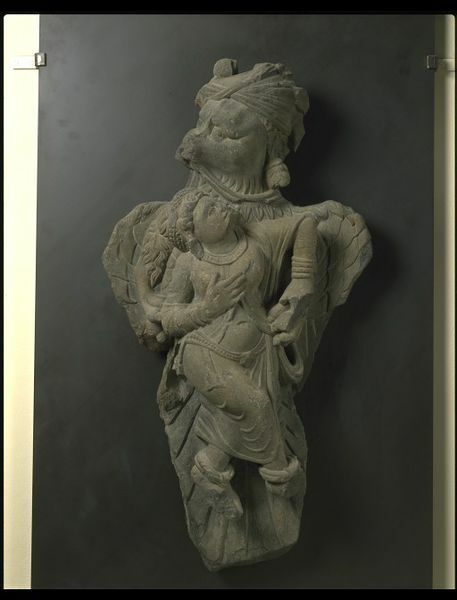 A figure of a Garuda abducting Queen Kakati. The head of the Garuda is turned slightly to the left and wears a turban suggesting the royal status of the Garuda; this is emphasised by the earrings which he also wears. He clasps Queen Kakati to his chest with his talons and since her feet are shown clear of the ground, the group appears to be already in the air. Kakati wears a loose robe with a jewelled belt, necklace, earrings and anklets; her hair is held by a jewelled fillet. This episode is described in one of the Buddha's previous-life stories, the Jatakas. 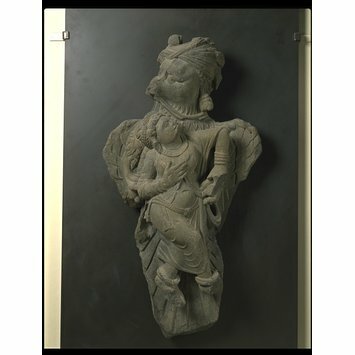 The Queen of Varanasi is carried by the mythical bird, only to be returned unharmed after her king (the bodhisattva, in fact) performs an act of selfless kindness. This relief depicts a scene from the Kakati Jataka, one of the legends relating episodes from the Buddha's previous lives. The queen of Benares is seen being carried off by a mythical bird creature (Garuda). She is returned after the king (the bodhisattva) performs an act of selfless kindness. Guy, John. 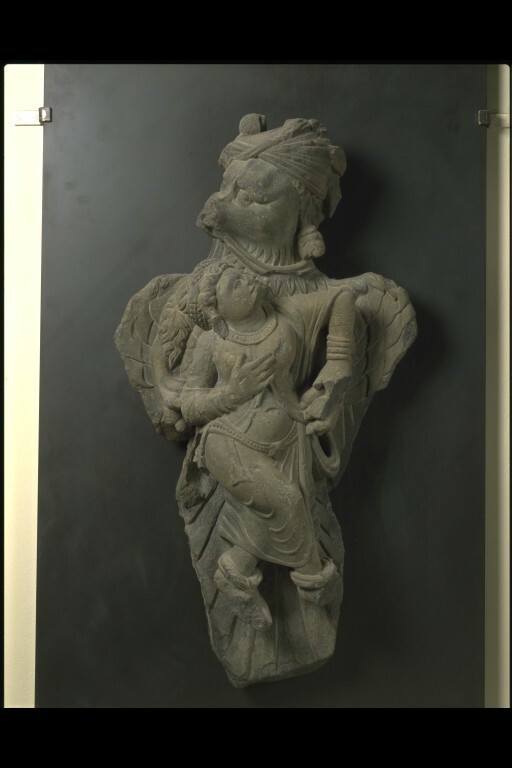 ‘Indian Temple Sculpture’, London : V&A Publications, 2007. p.24. pl.16. a royal turban and earrings.